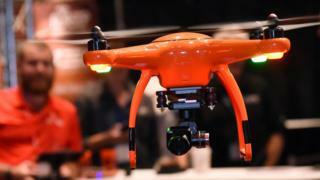 Image caption Industry group UAS Sweden said that the ruling requiring camera drones owners to have a surveillance licence was a "bad decision"
Under new rules set down by the Supreme Administrative Court of Sweden, camera drones qualify as surveillance cameras and require a licence. In what some are describing as a "huge blow" to the aerial photography and camera drone industry, the court ruled that drone-mounted cameras are "regarded as surveillance cameras". "It is a bad decision for Sweden as an entrepreneur country and ominous for the Swedish labour market that is constantly affected by new obscure and complicated regulations from the state and its agencies," said Gustav Gerdes, president of UAS. In the UK, people wishing to operate a drone must follow some basic safety rules such as keeping it within line of sight, no more than 400ft above and 500m ahead, according to the Civil Aviation Authority's drone code. Drone operators must also "respect the privacy of people" around them and anyone with concerns about drones being used in their area are advised to contact the police.